With our Do-It-Yourself Website Platform, you'll receive one all inclusive monthly fee that fits your budget! 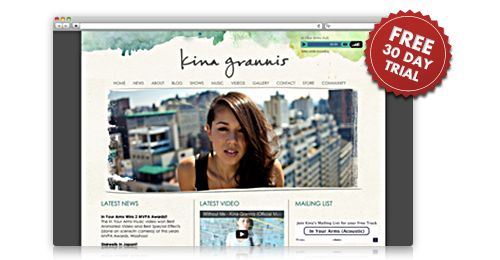 Our Do-It-Yourself Music Website Platform puts you in control of your online presence. Our easy-to-use website platform allows you to create a beautiful, customized website for NO SET-UP FEE. When you launch your website, you'll pay one low monthly fee that includes around the clock customer care to help you when you need it! Need a More Custom Website? With the Section 101 custom website services, our team of expert designers and specialists will help you create, plan and build your amazing music website. Contact us at [email protected] or 888.974.9950 to speak to a Section 101 specialist. Packages typically start at $10,000. I love my new website! Can I set up payment right away? Glad you like it! You can set up your payment profile at any time during your free trial, which won't affect your trial. I think I'm ready to get started! What next? You can schedule a personal Getting Started Session, with one of our expert website building specialists at a time that works for you. Or, visit our Sign Up page to jump right in. Do you offer discounts for yearly payment? Yes. When you pay anually, you will receive a 20% discount, which is more than 2 months for free! Do Section 101 websites work on mobile devices? Yes, Section 101 websites look amazing on mobile devices. Yes, and much more! We are integrated with Google Analytics, so that you can see everything from the number of visitors to your website to the time spent on your pages. We can even show you your social networking stats. Absolutely! Your Section 101 website is designed to make content creation and sharing easy. Seamlessly link to Facebook, Twitter, YouTube, and more. When you post a new song, news article or blog to your website, you can also post them out to your different social networks. Absolutely! We’re integrated with PayPal, so you can set up and manage your online store, and keep 100% of your profits. You can also integrate with 3rd Party Stores, like TopSpin, Shopify, and many more. Section 101 is the premier website solution for professionals in the artistic community. Anyone can use our platform, from established and emerging musicians to music companies to authors and publishers. Contact us at [email protected] or 888.974.9950 to speak to a Section 101 website specialist. After you’ve signed up, use our Support Tab or Live Chat. For more information, check out our 24/7 Customer Care Center.